4-pocket notch collar lab coat with princess seaming front and back and button tab back detail. Center back length: 30". 3-pocket princess seamed lab coat, inset belt detail, back loose belt with button and back vent. Center back length: 34". 3-pocket 'marquis' style v-neck top with princess seams, racer side details and fashion fitted back. Center back length: 25½". 2-pocket mock wrap top with princess seams and an elastic back. Center back length: 26½". 4-pocket shaped v-neck top with welt front chest pocket, princess seam styling, front and back double needle detail and styled fitted back. Center back length: 25½". 2-pocket princess seam with back inset belt and princess seamed back. Center back length: 35". Sleeve length: 24¼" - 25¼". 2-pocket round neck snap front warm-up with princess seams, banded side and back detail. Center back length: 27". 4-pocket v-neck with princess seaming and perforated panel details in front and back. Center back length: 25½". 4-pocket jewel neck warm-up with shaped perforated princess seam front hidden pocket, logo zipper pocket and snaps with racer back athletic perforated styling with seamless sock cuff trim. Center back length: 27". 2-pocket crew neck, zipper front jacket with detail princess seaming, side zip pockets, and a high-low hem. Center back length: 26". 2-pocket mock neck zipper vest with detail princess seaming side zip pocket and a hi-low hem, fitted back. Center back length: 26". A stand collar details this stylish button-front twill top with two roomy patch pockets. The princess seaming and center back elasticized waist give soft shaping. Great for the healthcare professional or for the medical student. Center back length 28". Sporty, contemporary fit warm-up jacket features two front welt pockets and a front zip closure with zipper garage to protect your neck. Also featured are sleeve seaming detail, an instrument loop with signature logo rivet on right sleeve, front and back yokes, and front and back princess seams. Front side panels, waistband and cuffs are in a soft, stretchy knit for extra comfort. Center back length: 26". A chic lab coat features a tailored fit with black princess seams, concealed button front placket, pointed shirt collar, button cuff sleeves that roll up with button tabs, front welt pockets, and hi-low shirttail hem. Center back length: 40". 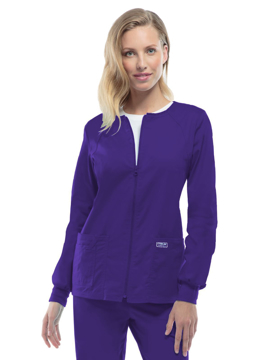 This sporty zip front warm-up jacket features front and back shoulder yokes, front princess seams with flat piping, hidden pockets with a zipper closure and a logo zipper pull. The back panel, collar, cuffs and waistband are made in a stretch rib knit for extra comfort. Coverstitch detail throughout. Center back length: 26". 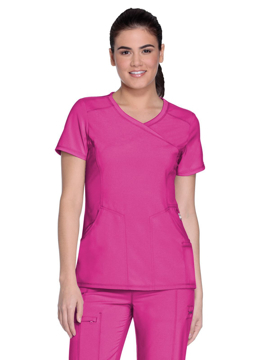 This mock wrap top has piping around front neck, front princess seams, self belt at empire waist with logo snap, angled patch pockets, back elastic, and side vents. Center back length: 25½". This warm-up jacket features a Luxe logo on each of its front snaps, piping at the jewel neckline, front and back princess seams, two patch pockets and an additional angled pocket with multiple pin-tucks and tonal zig zag stitching. Knit cuffs complete this jacket. Center back length: 27½". A contemporary fit mock wrap top features tonal stretch knit mesh side panels and perforated, mesh-lined shoulder yokes for style and comfort. Also featured are set-in front pockets (the left with a logo charm), two interior pockets, a back yoke, front and back princess seams, and side vents. Center back length: 26½". A contemporary fit, zip front warm-up jacket features tonal stretch knit mesh side and back panels, and perforated, mesh-lined shoulder yokes for style and comfort. Also featured are front and back princess seams, set-in front pockets with reflective piping, a logo zipper pull, back yoke, rib knit neckband and cuffs, and a shirttail hem. Center back length: 28”. This fitted blazer-style lab coat features two front patch pockets with additional side entry pockets, a three button front, slimming front and back princess seams and a sewn in back belt with four release pleats for ease of movement. Center back length: 28". 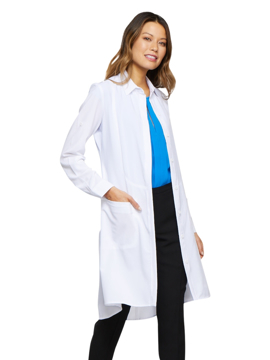 This fit and flare lab coat features a notch collar, front yokes, front and back princess seams, two roomy double patch pockets with stitched down instrument holders, center back vent, adjustable back button tabs. Center back length: 36". 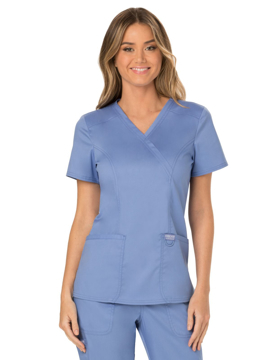 This stylish and figure flattering lab coat features a notched collar, front and back princess seams, angled front patch pockets, back belt with button detail, and mock sleeve cuff. Center back length: 36". This notched lapel lab coat features a snap front closure, multiple pockets include, two roomy patch pockets, a cell phone pocket, a chest pocket with a pencil stitch, snap back belt detail, and side vents, princess seaming as well as front darts and a back yoke provide easy shaping. Center back length: 32". 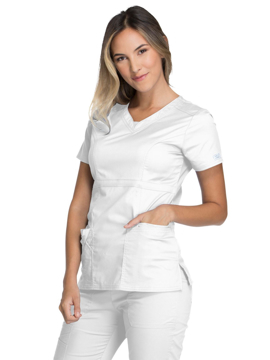 This twill lab coat features a four button front, front princess seams for a flattering fit, front angled pockets, a stylish back belt with buttons detail, back yoke and center back vent. Center back length: 30". This mock wrap top features front princess seams and double needle top stitch detail. Also included are front patch pockets, a right side pocket with a sectional pocket and I.D. loop, a left side pocket with an instrument loop holder across pocket. Back princess seams and side vents complete the picture. Center back length: 27". This v-neck top features crossover front yokes and patch pockets. The right side pocket has a sectional pocket and I.D. loop, the left side has an instrument loop holder across the pocket. A back yoke, back princess seams and side vents complete the picture. Center back length: 27". 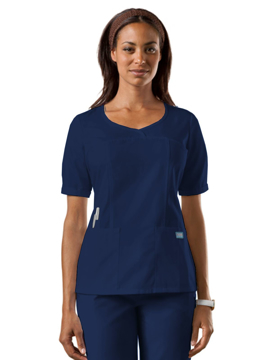 This v-neck top features front shoulder yokes with an ID badge slot, a stethoscope loop, patch pockets, an interior pocket, a pen slot and a back pocket. Also featured are front and back princess seams, side vents and double-needle topstitching. Center back length: 26". This empire top features rounded V-neckband with a dickie inset, yoke panels, front and back princess seams. It also features multiple patch pockets; wearer's right has stylized double pocket with twill tape loop and left has an additional cell phone pocket. Double needle topstitching and side vents complete this fun, youthful top. Center back length: 25". This round neck zip front warm-up jacket features two patch pockets, a right side pocket with a sectional pocket and I.D. loop, back yoke, back princess seams for slimming fit, and matching knit cuffs. Center back length: 27". 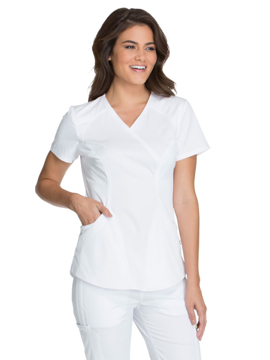 A modern classic fit v-neck top features a slightly curved front yoke, front princess seams, front patch pockets, cell phone pocket, above elbow length sleeves with notched turn back cuff, and half back elastic and side vents. Center back length 26". A modern classic fit mock wrap top featuring patch pockets, a hidden instrument loop, logo label with bungee loop, front shoulder yokes, front and back princess seams, and side vents. Center back length: 26". A modern classic fit v-neck top featuring a right double patch pocket with instrument loop, left patch pocket with pencil stitch, logo label with bungee loop, back princess seams and side vents. Center back length: 27". A modern classic fit, snap-front warm-up jacket featuring two patch pockets (the right with an interior cellphone pocket, the left with a pencil stitch and hidden instrument loop), a logo label with bungee loop, front and back princess seams, a back yoke, side vents, and knit cuffs. Center back length: 27½". This stylish and figure flattering button front lab coat features a notched collar, front patch pockets, an instrument loop over the left pocket, front and back princess seams, and a back belt. Center back length: 33". This executive women's coat features double needle stitching, front welt pocket, thermometer pocket on the sleeve and princess seams in the back for a flattering fit. It also has covered buttons and French cuffs. Center back length: 30". 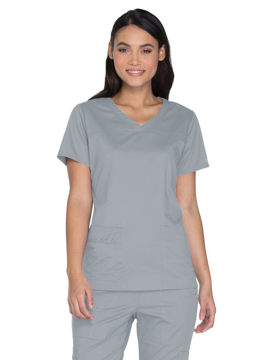 A contemporary fit v-neck top with rounded patch pockets (the right with inside tonal cable-routing outlet), sleeve zipper pocket, yokes and princess seams, and a shirttail hem with side vents. Center back length: 26".